History: Part of Professor Beauclerc's expedition to the jungles of Africa, scientist Phil Britton had left the safety of the camp for a walk when he was attacked by a sabre-toothed tiger. It bit his arm, but then, as he passed out, the animal inexplicably died. The Professor soon found the pair, and porters carried both the unconscious man and the dead beast back to camp. After confirming that Britton's injuries would heal with proper care, the Professor turned his attention to the enigma of the tiger, a creature that was believed to have become extinct millions of years ago. Before he could do more than speculate Britton awoke, just as a porter rushed in to announce that a lion had invaded the camp. In a fit of bravado Britton told the Professor to leave the big cat to him, and raced out to confront it; after Britton grappled with it for a few seconds and struck it on the nose, the lion fled in fear, with Britton vainly noting that the beast knew its master now. Witnessing this display of superhuman prowess the Professor concluded that the sabretooth had died because it had somehow passed its strength to Britton through its huge teeth, making him part man, part tiger. Liking the idea, Britton declared himself Tiger-Man. Comments: Created by Dennis Gifford. 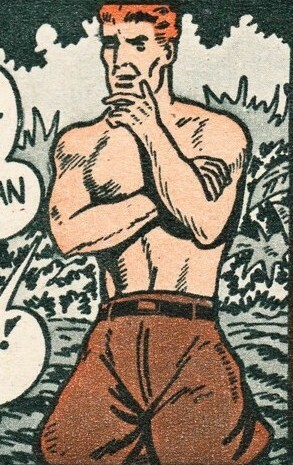 Though the first page image of Tiger-Man depicts him dressed like a Tarzan clone, he's actually in regular clothes throughout the actual story. 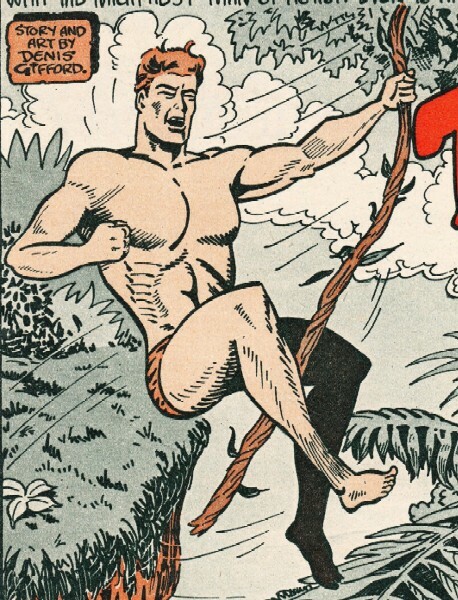 Thanks to Dennis Ray for providing scans of this character's debut story, allowing me to flesh out this entry with images and biographical details.